Golfers have some excellent choices in the area. 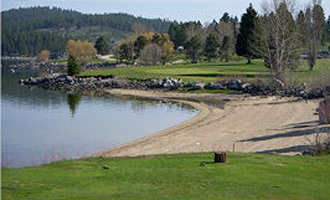 Cascade Golf Course has a challenging 9-hole golf course and restaurant overlooking Lake Cascade with magnificent scenic views of the surrounding mountains. Even though this is a 9-hole course there are four sets of tees set up to play 18 holes with a different approach to the green on each round. For the adventurous golfer, Yellow Pine has a very unique “backcountry” 18-hole course. Be sure to bring extra golf balls with you, and leave the golf shoes behind; hiking boots are more appropriate.